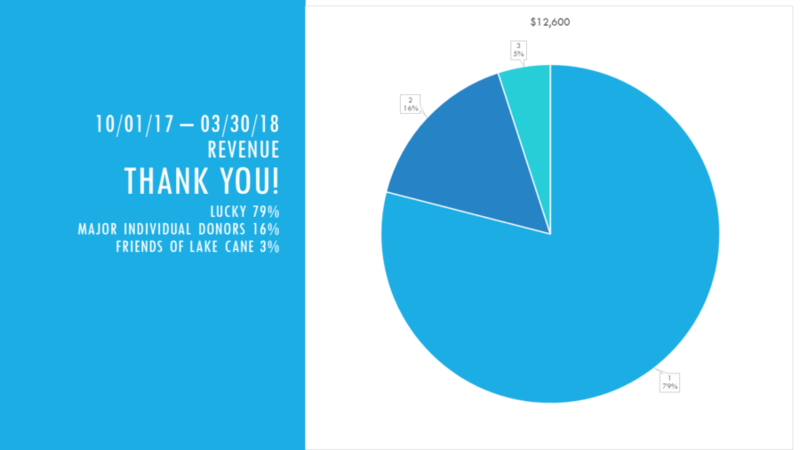 The activities of LCRS receive their financial support from an annual Friends of Lake Cane drive and the Lake Cane Champion donation program. Science and education grants will also be pursued as the need arises. Funds raised enable Lake Cane Restoration Society to provide environmental activities necessary to maintain and improve the water quality of Lake Cane. When dense mats of the invasive plant species hydrilla began to dominate the lake, LCRS sponsored a fundraising effort in October 2013 to provide 230 carp. Another drive for donations in September 2014 resulted in re-stocking with 270 carp for a total cost of slightly more than $5,000. Improvement has been noticeable; however hydrilla persists as a visual and sensory detraction from the Lake Cane swimming experience. Other non-chemical methods for controlling hydrilla, such as hand-harvesting by scuba divers and snorkelers, are being explored. Managing the nutrients in the water is another activity of Lake Cane Restoration Society. Monthly water samples have been collected starting in September 2015. These samples are analyzed for total phosphorus and total nitrogen. As we monitor these data, we will be able to determine which environmental processes offer the best solution for restoring the lake. Some of the activities under consideration are shoreline plantings with native plants; creation of bioswales to remove silt and pollution from surface runoff water; better management of stormwater runoff; and education of residents throughout the Lake Cane watershed area regarding best practices for fertilizing and other activities that affect the health of the lake. By monitoring the Trophic State Index (TSI) to determine the trend of the lake’s water quality, we will be able to make data-driven decisions on additional environmental services or equipment required for maintaining and improving the quality of the water, and will be able to provide free resource materials to swimmers and to area residents. Funds are also used to maintain membership in professional organizations supportive of LCRS goals – such as the American Water Works Association (AWWA) and the Rollins College Philanthropy & Nonprofit Leadership Center.